The Strøget in Copenhagen, Denmark is one of Europe's longest pedestrian-only shopping streets. Established as a car-free zone in 1962, this shopping district stretches over a little under a mile through the heart of medieval Copenhagen and features countless boutiques and larger shops in all price ranges. More than just a busy street, the Strøget encompasses a larger area of smaller side streets and many historic town squares. On signs in Copenhagen, you'll see its Danish name Strøget, but it is also commonly spelled Stroget in American travel guides. If you want to do some shopping in Copenhagen, the Strøget is a must-see, and even if shopping doesn't interest you, there's plenty to see and do including grabbing a traditional Danish dinner, watching the Royal Guard march to Rosenborg Castle, and seeing one of the many street performers that have become famous in the area. Along the Strøget, you'll pass the streets Frederiksberggade, Gammel Torv, Nygade, Vimmelskaftet, Amagertorv and finally Østergade, each of which branches off to a number of smaller shopping districts and historical buildings. At the other end of the Strøget is a place called Kongens Nytorv (Kings New Square) with shops and theaters, and toward this end of the Strøget, you'll run across countless expensive designer boutiques such as Gucci, Chanel, Louis Vuitton, Boss, and many other big names. The Strøget's specialty stores include iconic brands such as the Royal Copenhagen porcelain factory and Georg Jensen Silver. Also be sure to stop by Europe's only Guinness World Records Museum, a must-see on Strøget, which has a life-size statue of the world's tallest man at its entrance. There's a secret to spending a lot less money on Strøget. Budget travelers and bargain hunters should start shopping at the Rådhuspladsen end of the Strøget. There you will find simpler foods, clothing chains such as H&M, and much lower prices in general. As you stroll toward the other end of the street, the prices increase. 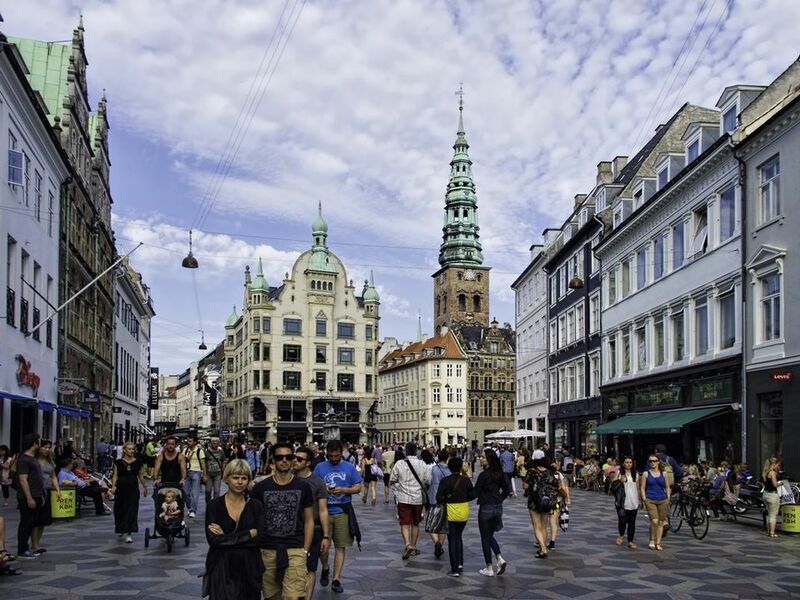 The Strøget isn't just a popular shopping destination in Copenhagen, it's a popular destination for a number of great activities, attractions, entertainment, and dining as well. You'll find a variety of restaurants, sidewalk cafes, and eateries featuring Danish foods, kebabs, organic hot dogs, Irish fare, and fast food, but be sure to stop by the famous Danish chocolatiers and bakeries here. You can grab a quick bite or sit down for a full meal at one of the great restaurants located on and around the Strøget. If you're looking for tourist attractions in the area, you can check out the Church of Our Lady, Stork Fountain, City Hall Square, City Hall Tower, the Royal Danish Theatre, or stop in at art galleries and museums. You should also try to be in the area by noon if you want to see the Royal Guard with an accompanying band march from Rosenborg Castle through the Strøget and on to Amalienborg Palace, which is the residence of Denmark's royal family. Copenhagen's Strøget is also popular among street performers due to the number of pedestrians passing through. Amagertorv Square is where you're sure to find musicians, acrobats, magicians, and other performing artists amid the hustle and bustle of this shopping area. Near City Hall Square, con artists will try to get you to participate in games, so steer clear.